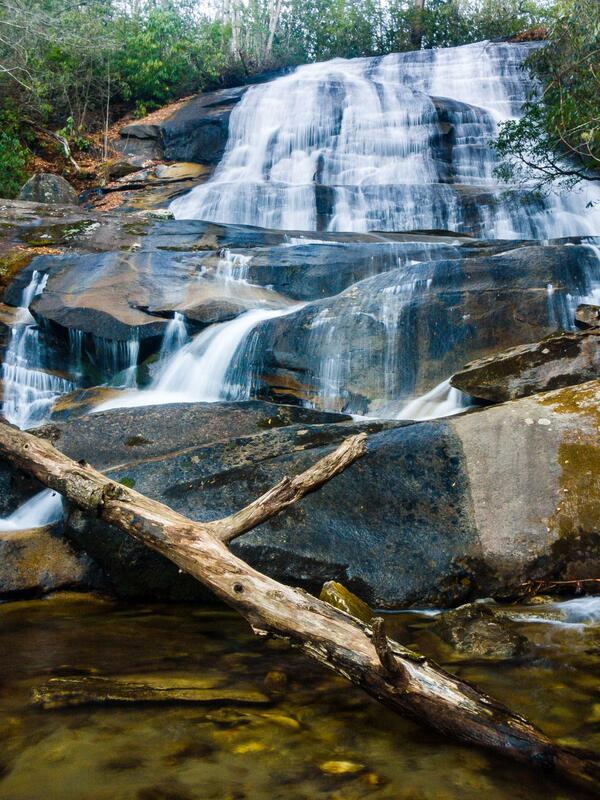 This beautiful falls is often overlooked but the hike to it is easy and well worth it. This is a high, steep slide/cascade with a few free-fall ledges. The flow splits into several paths on the way down, and there is a flat ledge about 2/3 of the way down. Like most waterfalls, it looks higher in real life than in any pictures I've seen or taken. From the intersection of U.S. Hwy. 64, 276, and N.C. Hwy. 280 in Brevard, go West on 276 (into the Pisgah National Forest) for 5.2 miles. Bear left on F.R. 475 at the signs for the Pisgah Center for Wildlife Education. Go 3.2 miles to the end of the pavement; the parking area is on the left just before a narrow concrete bridge. You will pass the Pisgah Center (and Fish Hatchery) on the left along the way. There is more than one way to get to the falls, and most guides unfortunately recommend the worst possible way. Despite the various trail names, the way I'll describe is both 1) the easiest, and 2) the simplest: you basically just follow the creek straight to the falls! To start, go up the gravel road behind the gate; there is a large sign board on the right. The road fords the creek after 500 feet or so; follow the trail to the right instead which leads to a nice footbridge, then joins back with the road. Continue up the road; the hike along this section is pleasant. The creek will now be on your right and you will pass several small cascades and potholes at one point. The road climbs gently toward the group camping area. Unfortunately, you will see many dead Eastern Hemlock trees along this stretch, as you will along most of this hike. As of January 2014, almost all were dead. They were once a defining characteristic of this cove; now, something else will have to slowly take their place. On your left just before the first big clearing, the Caney Bottom trail will exit left, uphill. Go straight. Pass through the large clearing for the group camp. The road will enter the woods near a pit toilet on the other side of the clearing. To the right is a small "sliding rock" with a large pool at the bottom. This makes a popular place to cool off during the summer, and, yes, people do use the bumpy rock as a waterslide! The road will reach another ford of Cove Creek shortly. Bear left on the path closest to the creek to find another footbridge. You'll then enter the second group camping area; it's another large clearing. The gravel road ends; bear left toward the creek and pit toilet. Take the trail to the left at the far end of the clearing leading upstream along the creek. You'll follow this path upstream all the way to Cove Creek Falls. Just ahead, the blue-blazed Caney Bottom trail joins from the right (in two places, lol), follows your path for a few feet, and then exits to the left to cross the creek on a footbridge. Just keep on going straight, up the right side of the creek, onto an unofficial but easy to follow trail on an old roadbed. (There is another unofficial path on the other side of the creek leading up to the falls which, unfortunately, gets more use than this one, but it's 1) muddy, 2) steep, 3) eroded, and 4) worse in every way, so just go straight.) The path is easy at first, but soon starts climbing a bit. It goes up and down some just before reaching the falls, about 850 feet past the Caney Bottom bridge. The viewing area on this side of the creek is vastly better than on the other side. You may also use the route below instead, if you prefer to bypass the camp or use only "official" trails. Bear left onto the Caney Bottom trail just before the first camp site. This trail undulates - steeply in places - to a junction with the Caney Bottom trail proper on the right. Just continue straight; now this path is called the Cove Creek trail. You will see and hear the falls on the right; an obvious faint scramble path angles down from the top of the falls to the base, just past a yellow-blazed hemlock tree. The path was signed "Cove Creek Falls" on my last visit, but don't count on it. You could also go to the falls via one route and back via the other to make a loop hike. The creek crossing below the falls is tricky and the view is better on the "unofficial" side, though; keep that in mind if you're not doing the loop.